The lightweight material Foamlite® is now available in different dimensions ex stock. Foamlite® is especially developed for applications in which construction materials need to have a very low weight and a high level of mechanical stability. The closed-pore foamed material offers construction engineers a wide range of possibilities in lightweight design. 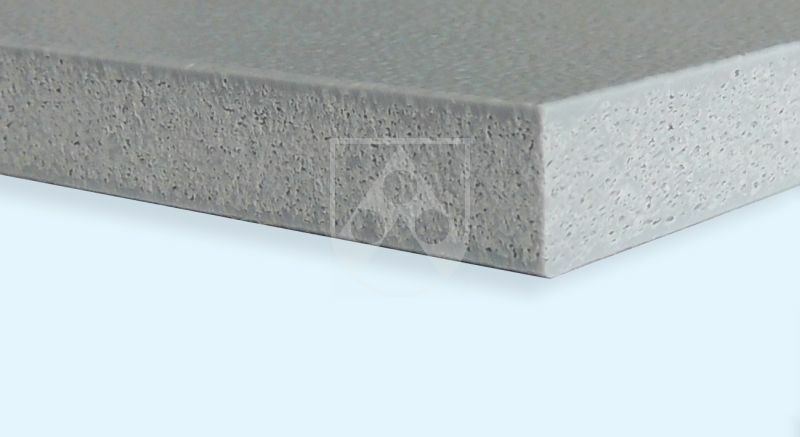 Foamlite® Pis a PP-C-based lightweight construction material. With a density of 0.65 g/cm³ it is nearly 30 per cent lighter than comparable compact sheets. Therefore the lightweight sheet saves on materials, conserves resources and is easy to handle. This offers completely new possibilities in the design of your application and in dimensioning, as well as economic advantages. Foamlite® is also available in special product variants ex stock. Foamlite® P is available in a slip-resistant design with the special "cubic grain" surface structure. Tests show: The three-dimensional, cube-shaped grain ensures a mechanical frictional connection between floor and shoe. We have developed Foamlite® P AST especially for areas where there is a need for controlled conductance of electrostatic charge and low weight at the same time. High voltage pulses can arise with uncontrolled electrostatic discharge and destroy sensitive equipment, components and workpieces. With Foamlite® P AST, these components are protected by controlled conductance of the electrostatic charge.